It is definitely time for an update on one of my favorite Palm Trees, the Ptychosperma waitianum. This Palm Tree is a flamethrower Fishtail Palm Tree. As most Fishtail Palms are clustering Palms, this one is solitary. You can see my previous post and pictures by CLICKING HERE. Back in January 2008 I received some seeds in the mail. I began germination on January 23, 2008 to be exact. I saw 2 sprouts on March 17, 2008. Only one survived. Since Germination almost 3 years ago, my Ptychosperma waitianum Palm Tree is all of 9 inches tall. It is growing very slowly. Here are a few pictures to show you the progression. Now you can see the "Flame" in the fronds. This first picture shows the fronds awesome coloration. This second picture shows the height. These next two pictures show the new growth. Well I hope you enjoyed this updated post on my Ptychosperma waitianum Palm Tree. See you again next time!! Hello! It has been a year since my last post. I have been extremely busy and I do apologize. I have chosen to come back with an update on my Rainbow Gum Eucalyptus (Eucalyptus deglupta) or Mindanao Gum Tree. If you want to read my previous post and see the pictures just CLICK HERE. I planted this amazing tree in the ground March 22, 2010. That puts it in the ground for 7 months. When I planted my Rainbow Gum Eucalyptus it was 2 feet tall. In 7 months my Rainbow Gum Tree has doubled in size. Here are some pictures that I have taken to show you. 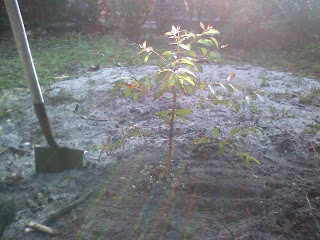 This first picture was taken right after I planted it in the ground. I want to apologize for the picture quality as I took it with my phone and for some reason only took 1 picture. This second picture was taken today. Here my Rainbow Gum Eucalyptus (Eucalyptus deglupta) stands 4 feet tall. In this final picture of my Rainbow Gum Tree you can see the discoloration beginning to take place. Well that's all I have for now. I hope you enjoyed this update of my Rainbow Gum Eucalyptus Tree (Eucalyptus deglupta) or Mindanao Gum Tree. See again next time! !